Hi there! We finally finished painting the French doors to our study and I'm so happy with the new look! Our study is right next to our front entry door, which is also black and it looks so much better. I also have an entry table and buffet that are both black in this open entry area, so it flows nicely with those pieces as well. I love the contrast against all the white in this room! You can see the doors before in the below picture. I ended up going with Sherwin Williams Urbane Bronze for my color, which is a deep charcoal as opposed to pure black. And I'm so pleased with the color! To paint the doors, we took them off the hinges and sprayed them with our paint sprayer and compressor using the same technique as this project, giving it a nice smooth finish. You can see more of our office transformation and some embarrassing before pictures by clicking here, here, here and here. It's been quite the journey. So pretty, they look fabulous against your white, Becky! Thanks Pam! Loving the new look. Wow, I really love the black! Its crazy how different everything looks just with the change of the door color! I know! Such a simple project, but huge impact! Thanks! The black is such a gorgeous contrast. I love it. Love the new black doors! They make such a great impact on the room! Since painting the living room and hallway gray with white trim, we are looking to replace the doors to all the bedrooms eventually and were thinking white. But I keep seeing black doors and falling more in love with that look! I know, I'm a lover of the gray and white too, but I kept seeing the black interior doors everywhere and finally went for it! And love it!! Jealouse! They look ahhhmazing. 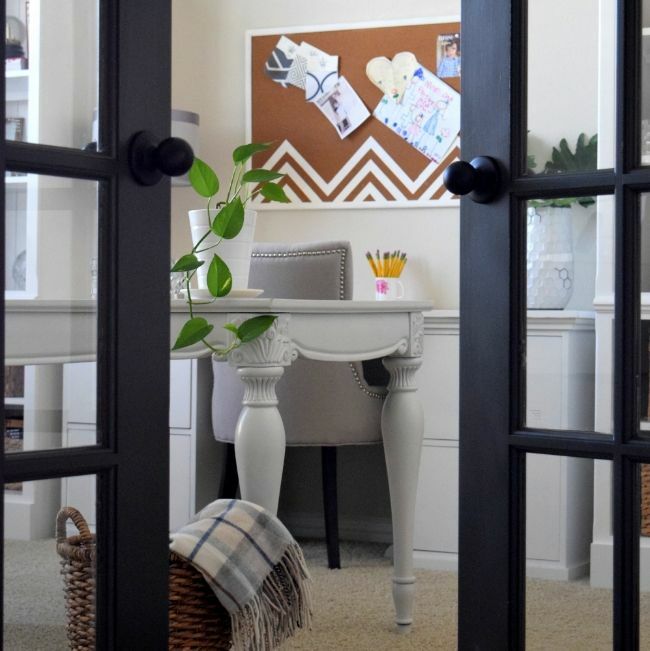 I'm dying to paint the interior of my front door black. just need to convince the hubs that its a good idea…. Wow Becky, that before and after!! 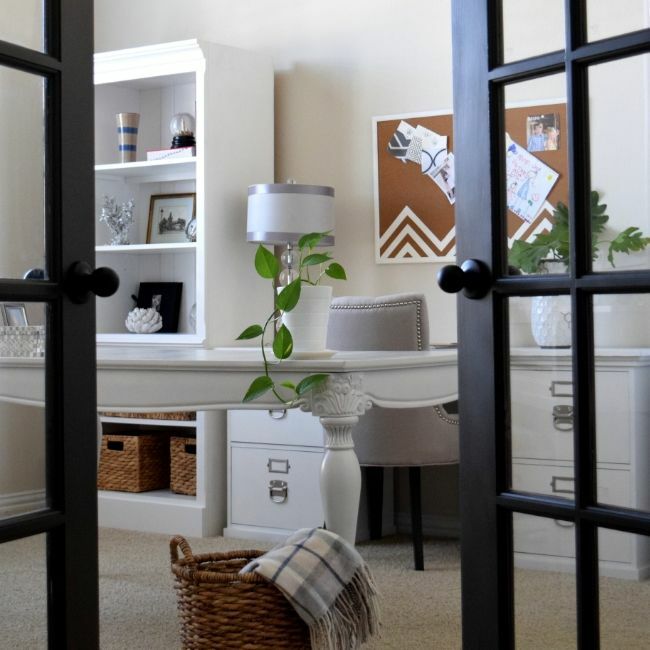 I love white French doors too, but the Urbane Bronze looks sooooooo good in your house!! Gorgeous!! That is some really clean paint job! 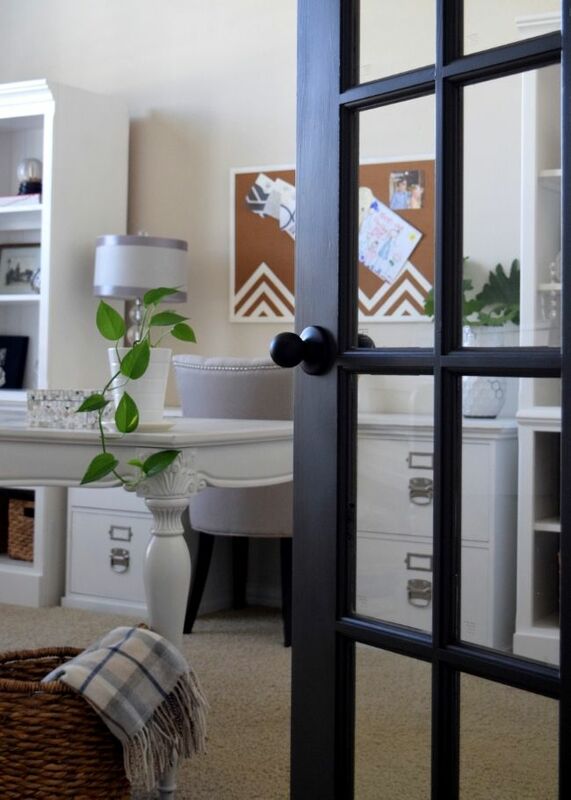 I agree that painting the doors black is a great decision because compared to the original, the new black door seems much more modern and slick. I also think the new door really accents the room well. I might have to do a little home makeover as well over the weekend! Love your black doors. What sheen did you use for the Urbane Bronze?